consequently many persons seem to have more than one father. A further review of kindred words is obtained at the end of this page. See Harleian MS 3859 genealogy 10 for the error in the creation of Beli and Anna, the sister of Mother Mary. Peniarth 16, Peniarth 45, Hafod ms. 2 now in Cardiff. The Saints of Wales belong to eight great families. 1. That of Maxen Wledig, or Maximus the Usurper, 383-388. He is held to have married Elen, daughter of Eudaf, a petty prince in Arfon, and Aurelius Ambrosius probably claimed descent from Maximus. 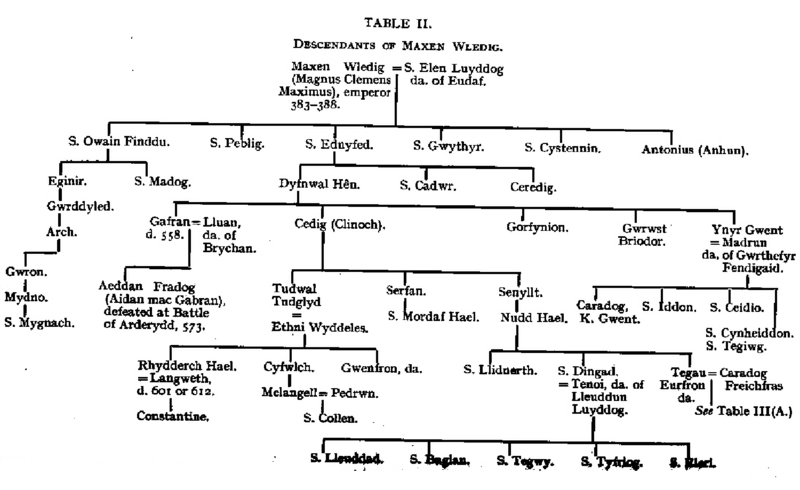 From the same stock came Rhydderch Hael, the prince who established himself supreme over the Cumbrian Britons; also Ynyr Gwent, prince of Gwent, who resided at Caerwent. This family would seem to have represented the Romano-British civilization. The pedigree has been disturbed by confounding Elen, the wife of Maximus, with S. Helena, the wife of Constantius and mother of Constantine the Great. 2. That of Cunedda, which came from the North, from the defense of the Wall, and which had been seated in the ancient Roman Valentia. 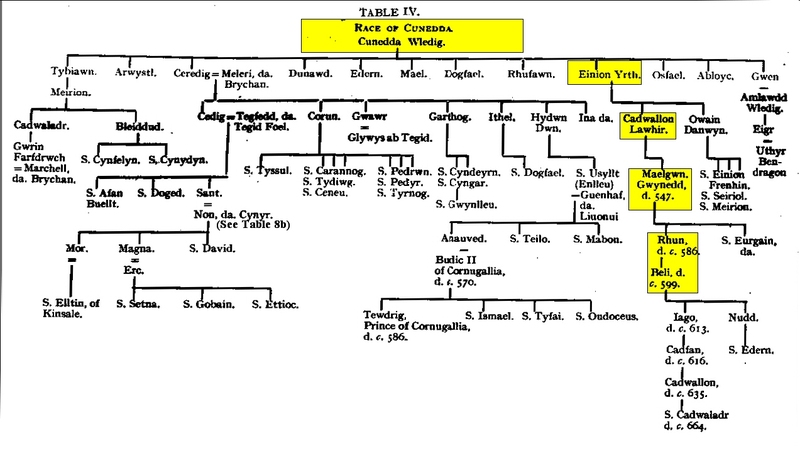 This family is said to have expelled the Gwyddyl from Gwynedd, Ceredigion and Mon, and to have also occupied Merioneth, Osweilion and Denbigh. From it proceeded the royal line of Gwynedd, which only came to an end with the last Llewelyn. From this family proceeded those important saints, Dewi and Teilo. 3. That of Cadell Deyrnllwg in Powys, which sent out a branch into Glywyssing. Cadell became prince of Powys with his seat at Wroxeter or Shrewsbury, in the 5th century, in consequence of a revolt of the Romano-British and Christian subjects of Benlli against their prince, who favored paganism. 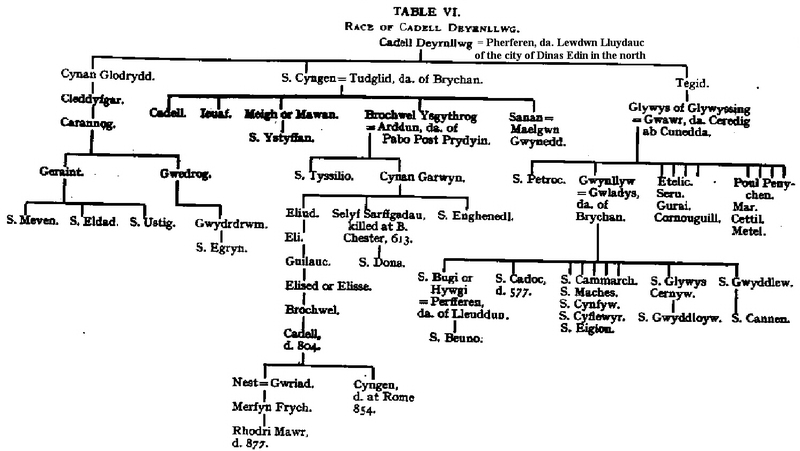 Cadell was grandfather of Brochwel Ysgythrog. 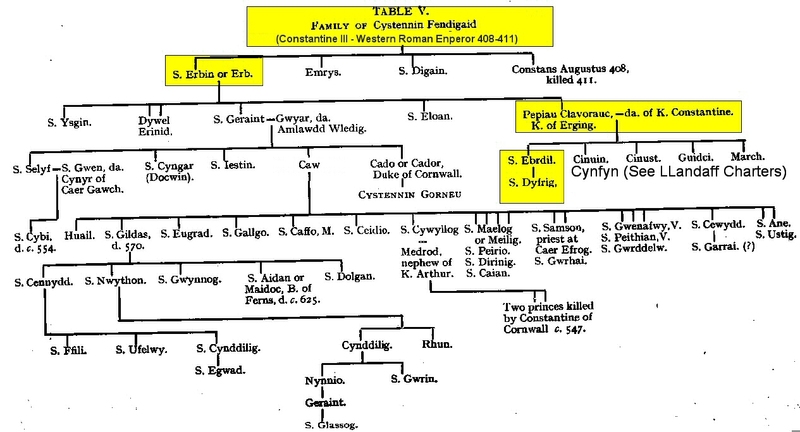 This family died out in the male line in Cyngen, murdered at Rome in 854. It produced several saints, notably S. Tyssilio of Meifod; and its branch in Glywyssing afforded the still more illustrious S. Pedrog and S. Catwg. 4. That of Brychan, king of Brycheiniog (Brecknock or Breconshire). 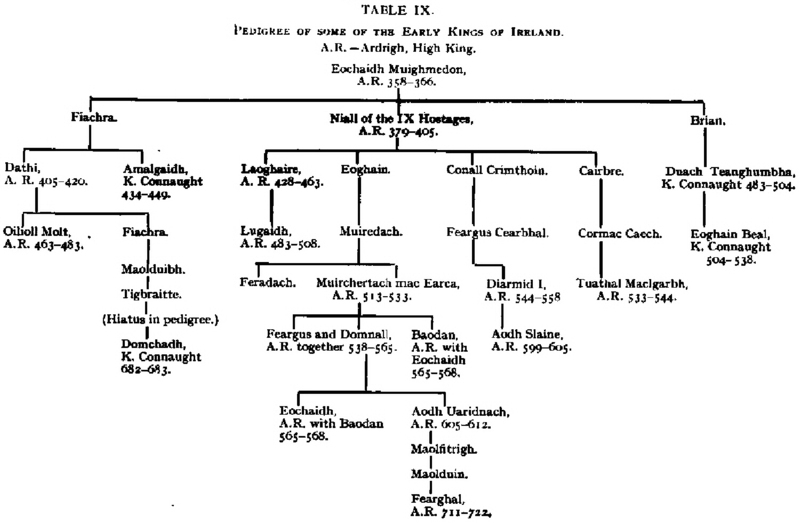 Brychan was born in Ireland to King Anlach and Queen Marchel. 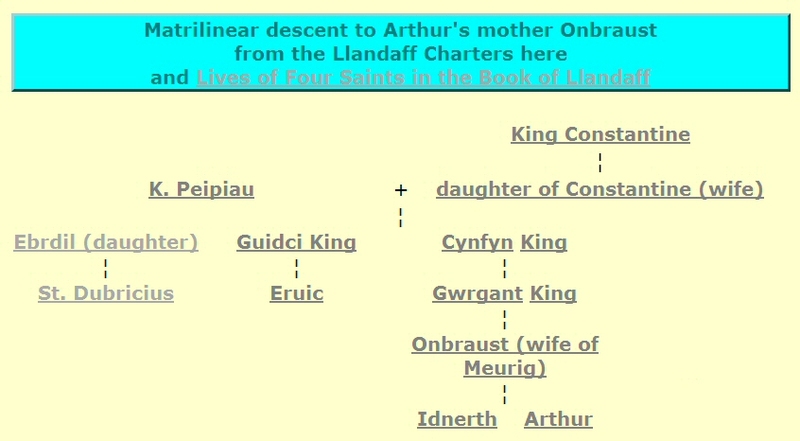 Queen Marth was heiress of the Kingdom of Garth Madrun in Wales. King Anlach, the father of Brychan, had also made himself master of Brecknock. The Brychan's family produced an incredible number of saints (some of whom were tacked on because of their popularity), who are found not only in their native district, but also in North-east and East Cornwall. De Situ Brecheniauc (the Circumstances of Brychan) (oldest) and Cognacio Brychan (the Kin of Brychan) appear to be derived from the same older source which is at as late as the 11th century. The genealogy also appears in the Jesus College MS 20 and there are also other sources such as Cornish: Life of Saint Nectan in the Gotha MS M.n.57, Irish: the Books of Leinster, Ballymote, Lecan and Uí Maine, and a Breton tradition. 5. That of Caw of Cwm Cawlwyd in North Britain. Caw, however, is manipulated to be was son of Geraint ab Erbin, Prince of Devon. See "Caw of Prydain unmasked"
6. That of Coel Godebog. According to Skene, he was king in North Britain, and from him Kyle now takes its name. He was ancestor of a large and important family, of Ynyr (incorrectly shown as Llyr Merini), of Urien Rheged, and of the poet Llywarch Hen. From him descended a great many saints, but none of any great importance. Pabo Post Prydynn, and Dunawd, and Deiniol of Bangor, are the most conspicuous. The saint of this family that proved most remarkable was S. Cybi. 8. That of Emyr Llydaw from Armorica. 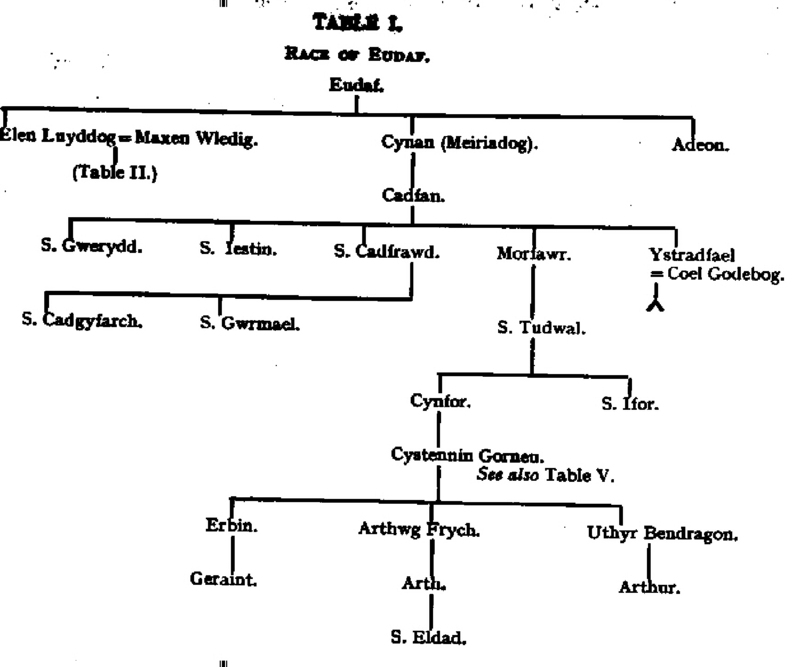 The Welsh pedigrees derive Emyr from Cynan, son of Eudaf and brother of Elen, wife of Maximus. 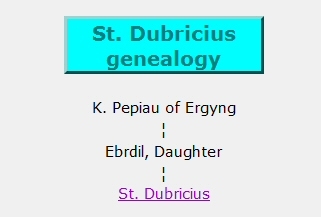 All that we really know about Emyr is that probably, on account of an usurpation by one of his sons, the others had to fly from Armorica and take refuge in South Wales, where they were well received by Meurig, king of Morganwg, who gave to several of them his daughters in marriage. The Bretons pretend that this eldest son, who sent his brothers living, was Llywel, or Hoel, " the Great ". From Emyr proceeded some men of great mark, as S. Samson, S. Padarn, and, ridiculously, S. Cadfan and S. Winwaloe. To them may perhaps be added that of Gwrtheyrn Gwrtheneu (Vortigern), but it did not proceed beyond the second generation, and then only through daughters. 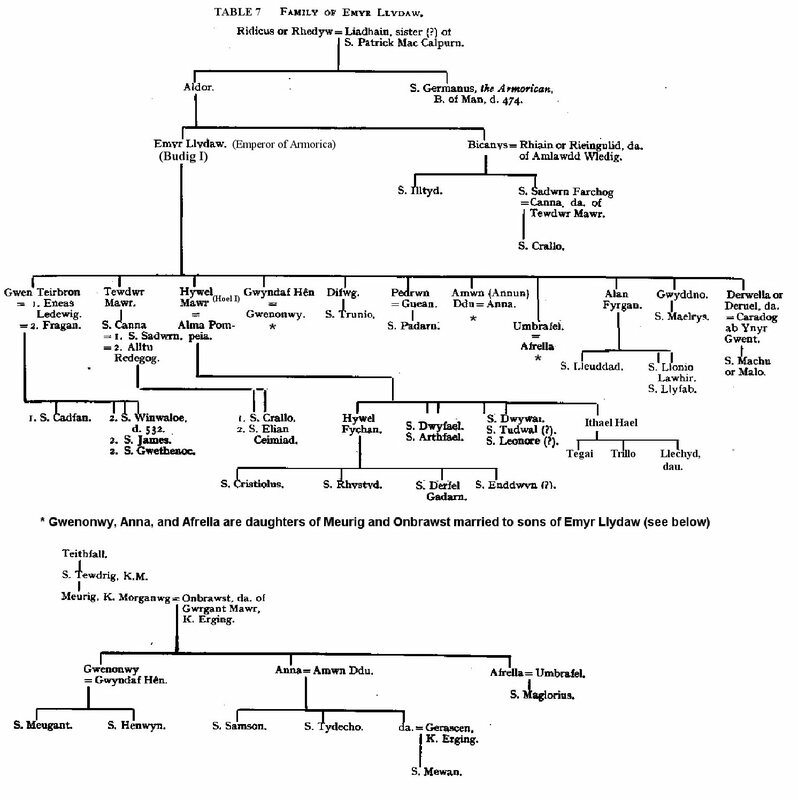 See Genealogy of Vortigern in Historia Brittonum. Some Irish Genealogies contained in The Expulsion of the Deisi are relevant to the region of Dyfed: (see comparison to Harlien 3859 Genealogy 2). An interesting point, in this age of personal genealogy searches, is that proof of collateral relationship for the Welsh was actually required in the ninth degree to determine the membership of a person in the tribe. Thus a whole family could be liable for a fine for a crime committed by one of its members, and each would be rated according to the proximity of kindredship. Hence the Welsh would often repeat their pedigrees with enthusiasm, whereas the Anglo-Saxons thought them stupid.